We were travelling across north-east Suffolk in sunny weather in September 2009, finding all the churches open, and so perhaps I felt a little more sympathy for the sight of Ellough church as he headed down towards it from the north. When I had first written about the church back in 2002, I had remarked on its forbidding prospect. And it is certainly true that the mean lines of the 14th century tower and the low pitch of the roof are severe. From the south, it glowers at the top of its wild hilly graveyard, like something out of a mid-19th century novel. On a stormy day, it doesn't take much to imagine a Victorian funeral procession picking its way among the gravestones. From the north, the prospect is even starker. The graveyard is flat and wide, obviously cleared, as so many were in the 50s and 60s. A long path from that time runs along the high wall, and is now broken up and overgrown. The whole place feels summarily abandoned, which, in fact, it was. 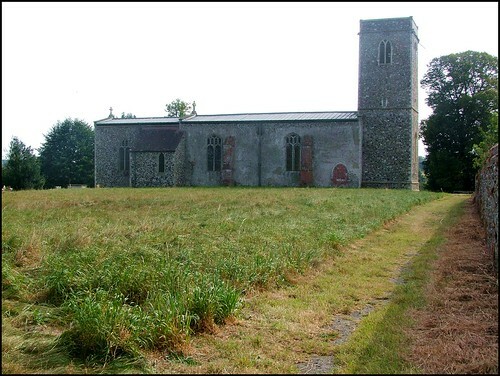 In 1973, All Saints was one of the first churches in Suffolk to be declared redundant. It is not hard to see why. This is a wild area, of narrow roads and few people. Some churches are warm sanctuaries in the face of such bleakness, but it is hard to imagine that All Saints was ever a comforting place. The church underwent a rather severe Victorian restoration, surprisingly the work of that great Anglo-Catholic architect William Butterfield, responsible for All Saint, Margaret Street. But none of the drama and beauty of that central London church are repeated here. He was also in charge of the restorations at nearby Ringsfield and Redisham. So, the chancel is tiled; a simple tractarian altar stands at the east end, and the organ chamber is also Butterfield's. The organ was removed, along with the pulpit and choir stalls, in 1973. The chancel arch is also Butterfield's and perhaps the angel corbels are most recognisably his. He kept the earlier roof, perhaps the best feature of the church. Interestingly, the base of the pulpit remains, with the haunting names of the 19th century labourers carved into the stone - this would have been hidden, once the pulpit was in place. Among them are B Keable, FC Allen, C Dack, R Boon FCA, H Warne and A Coll. They inscribed their names on the 7th December 1883 - was that the day the work finished here, I wonder? There is an unusual memorial to Richard Arnold and his wife Charlotte on the south wall of the chancel. Arnold was Rector here for more than sixty years in the 19th Century, and the marble monument features brass roundel portraits of them both. The memorial was placed here by his children, to mark the restoration of the chancel, and it looks as if Charlotte was almost half a century her husband's junior. There is no death date for her, but I suppose it is likely that she died young, which is a sad thought. Their portraits have a pre-Victorian elegance, as if they would be more at home in the Georgian town church of a Jane Austen novel than in this bleak, Gothic place. I still can't say that I warmed to this church, although I was awed a bit by its severity. After the gentle suburbia of Redisham and Ringsfield, the remoteness of Ellough is quite chilling. The name Ellough itself means 'a heathen place'. When I had been here before, I left the door open while I was inside. I didn't do that this time, not least because Peter Stephens was with me, but it still slightly spooked me, I'll admit. While he finished taking photographs, I went and sat in the porch, on one of the two old box benches. It was tempting to lift the lids and see what was inside, but I resisted. Up on the arch of the doorway was a scattering of graffiti, mostly from the 1970s and 1980s. As I sat there, one of the largest spiders I have ever seen emerged from the doorway and scuttled for cover.